Dr Seldin died April 25, 2018 at the age of 97. I was one of thousands of physicians whose life and career was shaped by this great man. The article below is the tribute to him that was published by Southwestern Medical Center, the institution that he devoted his life to and which was shaped by his giant intellect and equally giant personality and character. DALLAS – April 25, 2018 – Dr. Donald W. Seldin, known as the “intellectual father” of UT Southwestern Medical Center, died Wednesday, April 25. 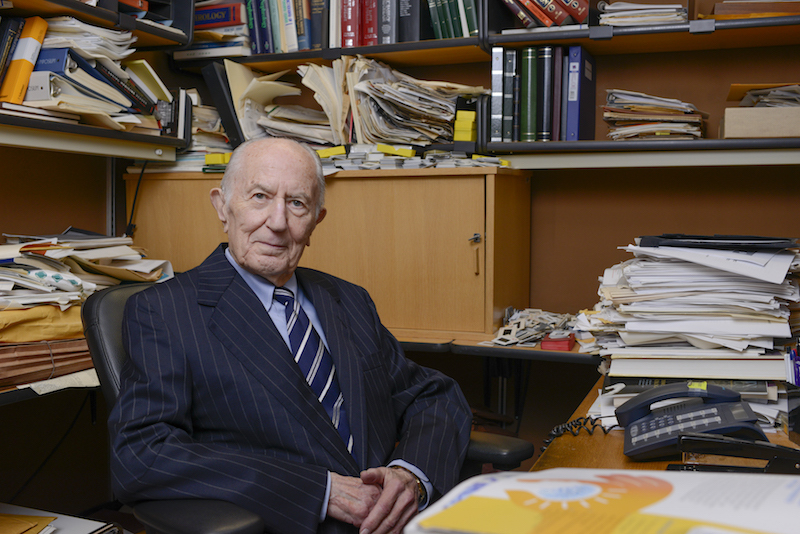 He was 97.The enduring contributions of Dr. Seldin, Professor and Chairman Emeritus of Internal Medicine, placed him among the most distinguished academic medical educators in the history of internal medicine. Throughout his 67-year career at UT Southwestern, his dedication to educating generations of top medical professionals, as well as his success in transforming a small medical school housed in converted Army barracks into one of the nation’s premier medical centers, are all part of the lasting legacy of this giant of medicine and higher education.Dr. Daniel K. Podolsky, President of UT Southwestern, said, “It is important to recognize the magnitude of Dr. Seldin’s many professional achievements. In his 36 years as Chairman of Internal Medicine at UT Southwestern, he held a singular view of what an academic department should be and built a world-class department around that vision – which has been emulated across the country.” Dr. Podolsky holds the Philip O’Bryan Montgomery, Jr., M.D. Distinguished Presidential Chair in Academic Administration, and the Doris and Bryan Wildenthal Distinguished Chair in Medical Science. 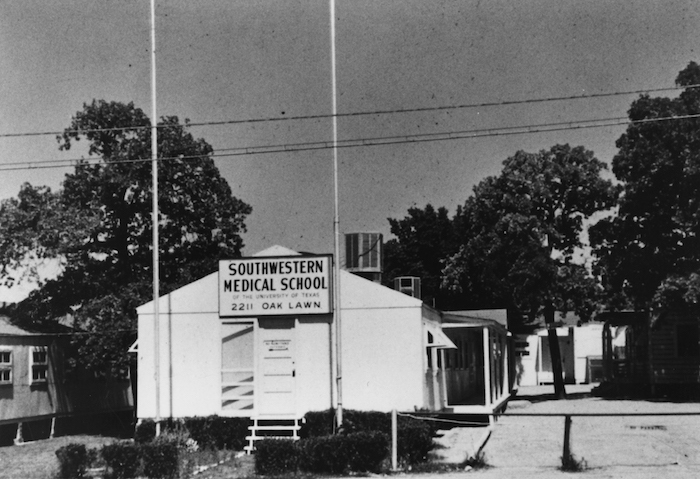 Dr. Seldin’s career at UT Southwestern started in 1951. The New York native was recruited to then Southwestern Medical School of The University of Texas from Yale University, where he had graduated from medical school in 1943 and, after serving in the Army, was subsequently appointed to the faculty. He accepted the Texas position sight unseen and was surprised to find a medical school housed in converted Army barracks known as “The Shacks.” Within one year, he became the sole remaining member of the Department of Internal Medicine. The 31-year-old New Yorker thought seriously about returning home but, instead, he accepted the challenge and became Chairman of the Department that he would ultimately bring to great acclaim. Dr. Seldin led the Department of Internal Medicine from 1952 until 1988. During his tenure, he garnered renown for identifying, motivating, and nurturing talented students, residents, and fellows who went on to become distinguished leaders and faculty members in the academic world. Dr. Seldin built a department recognized as one of the best in the country. He felt that the greatest advantage UT Southwestern had over established Eastern schools with great prestige was that it wasn’t encumbered by tradition. At the older schools, young professors had to wait their turn to become leaders. Dr. Seldin and his colleagues told recruits they could make a name for themselves more quickly at UT Southwestern. Among those who heard that message were Dr. Michael Brown and Dr. Joseph Goldstein, who in 1985 became the first among UT Southwestern faculty to receive the Nobel Prize in Physiology or Medicine. “Just the way a sculptor molds a figure out of clay, so Dr. Seldin has molded Joe and me, and many others,” said Dr. Brown, Director of the Erik Jonsson Center for Research in Molecular Genetics and Human Disease. “Dr. Seldin created a vision of medicine that was based on science and he brought it to fruition.” Dr. Brown, a Regental Professor, holds the W.A. (Monty) Moncrief Distinguished Chair in Cholesterol and Arteriosclerosis Research, and the Paul J. Thomas Chair in Medicine. Dr. Goldstein, a Regental Professor, holds the Julie and Louis A. Beecherl, Jr. Distinguished Chair in Biomedical Research, and the Paul J. Thomas Chair in Medicine. Widely admired as one of the greatest chairs of internal medicine in American medical history, Dr. Seldin was a visionary, a tenacious leader, and a demanding yet patient teacher. His vast grasp of medicine and creative energy created a climate at UT Southwestern that attracted superior faculty. He garnered innumerable teaching honors, was an early member of the prestigious Institute of Medicine (now the National Academy of Medicine) and the American Academy of Arts and Sciences, served as President of seven major medical societies, and received six honorary degrees, including one from Yale University, his alma mater, and another from the Université de Paris VI – Pierre et Marie Curie. Dr. Seldin was widely admired as one of the greatest chairs of internal medicine in American medical history. Dr. Seldin served as the only medical doctor on the committee that developed the Belmont Report by the National Commission for the Protection of Human Subjects of Biomedical and Behavioral Research that helped establish ethical guidelines, including informed consent, for medical studies in humans. Dr. Seldin was one of only a few medical doctors asked to serve on the RAND Corp. board of trustees, a global policy think tank. During his Army service after World War II, Dr. Seldin was the sole American expert witness at the trial of a subsequently convicted Nazi medical officer, which was highlighted in a later interview with the Journal of Clinical Investigation. Dr. Seldin held the William Buchanan Chair in Internal Medicine. In addition, several chairs at UT Southwestern have been created in his honor: the Donald W. Seldin Distinguished Chair in Internal Medicine, the Donald W. Seldin Professorship in Clinical Investigation, and the Sinor/Pritchard (Katy Sinor and Kay Pritchard) Professorship in Medical Education Honoring Donald W. Seldin, M.D. A major figure in the emergence of nephrology as a discipline, Dr. Seldin is a founder of the American Society of Nephrology, one of seven learned societies around the world to which his peers elected him president. Recently, Dr. Seldin was honored with a singular recognition at the “front door” of the South Campus. The Dr. Donald Seldin Plaza was announced in May 2014, and on March 16, 2015, a 7-foot bronze statue of Dr. Seldin was unveiled, along with an accompanying plaque commemorating his service. More than 400 people, including Nobel Laureates, philanthropists, and UT Southwestern leaders and physicians, attended the formal dedication. Donations in honor of Dr. Seldin may be directed to UT Southwestern Medical Center, P.O. Box 910888, Dallas, TX 75391-0888 or online at engage.utsouthwestern.edu/seldin-tribute.